As a home seller, you have to stage your home in the fall season to create warm inviting spaces that will let serious homebuyers feel more positively about your home. The goal of home staging in the fall is to help potential homebuyers visualize a comfortable and a happy life in your home. Curb appeal is imperative any time of the year and it is even more essential in the autumn season when you are trying to sell your home. Your home’s exterior is the first thing homebuyers see when they are viewing your property. 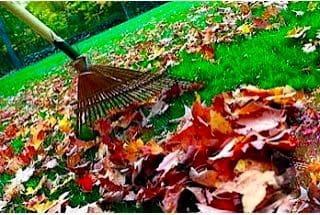 During the fall, the lawn should be mowed and the falling leaves should be raked up neatly. Bushes and trees should be trimmed. 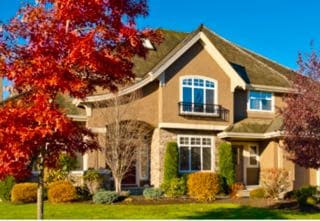 The fall season is very good time for home maintenance. Give buyers the impression that your home is well-cared for by cleaning the exterior of your home (gutters, windows, siding, yard work, deck or patio). During the fall season, spruce up your front yard curb appeal by adding fall seasonal flowers like mums, heliums, goldenrods or any fall plants to add a pop of color to your front yard. Add a new doormat and a seasonal fall wreath to your front door to make your home inviting to buyers. If you have a covered porch area add a bench or a small outdoor furniture set dressed with a cozy throw blanket and some pillows that have warm tone colors such as orange and yellow. Homebuyers love the idea of a porch area with seating because this visually spreads the idea of the living area offered by the property. The outside appearance of your home during the fall season should be neat, eye-catching, and well landscaped. A well-staged home interior in the fall season using fall themed accessories will give your home an inviting ambience. Give buyers the impression that your home is well-cared for buy cleaning the interior of your home. 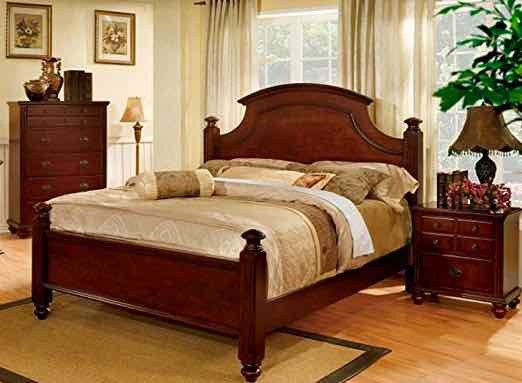 Each room in your home should be clean, de-cluttered, depersonalized, and staged for home selling. Add earth tone colored pillows, snuggly throws or other inviting textiles and fabrics (knit and faux fur) in the living room and the master bedroom to create a warm and comfortable atmosphere. Accent your kitchen by adding a bowl of seasonal fruits filled with squash, pumpkin, or large walnuts. Add a tray of cinnamon sticks on your kitchen countertop or island. 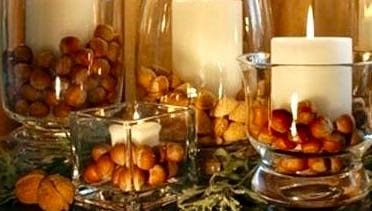 Accent your living room by displaying a decorative bowl or vase of pinecones, nuts, fall foliage, candles, or dried decorations (dried wheat or dried cornstalks) on the coffee table and end tables. To emphasize an inviting fireplace in the fall season you can add a tall bunch of dark colored twigs or sticks wrapped in twine on each side of the fireplace. 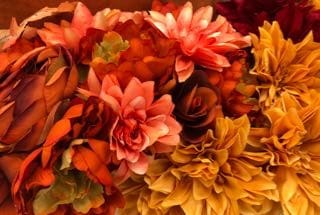 A vase of fall-colored flowers (marigolds, chrysanthemums, gerberas, roses, daisies, Mexican sunflowers or strawflowers) on the dining room table, on the fireplace mantel or on bathroom counters will make any room look inviting and add natural accents to a space. Decorate empty corners by filling tall glass vases with tall wooden sticks, leafy branches, or flowers. Design warm and ambient spaces by adding a cozy reading nook beside the fireplace if you have the space for it. Make your fireplace the focal point (center of attention) by decorating your fireplace with autumn décor to draw attention to it and to create a feeling of warmth and comfort. Keep the thermostat at a comfortable level during a fall home showing. Color schemes used in the fall season for home staging should try to match the warm and natural outdoor earthy tones of the autumn season. The fall landscape is the perfect place to pull inspiration from. Autumn color palettes vary from burnt orange, mustard yellow, olive green, cinnamon, red cranberry, and bronzes. These colors should be used as accents in any room décor to give your home irresistible appeal. A fresh coat of neutral (cream, light caramel) paint color during the fall season is a perfect idea to refresh your home’s interiors and to give your home a warm inviting feel. Fall has several pleasing fragrances connected with it and who doesn’t like a house that smells good. Light some scented candles with autumn tone smells (vanilla, apple cinnamon, pumpkin spice, cranberries or ginger spice) to attract buyers through their sense of smell, instead of lighting standard floral scented candles. 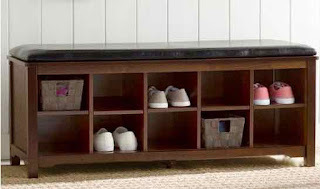 Back to school season starts in the fall and can create clutter in your home entryway. Control this clutter by creating a storage space for backpacks, shoes, and other items the kids need to grab before going to school. 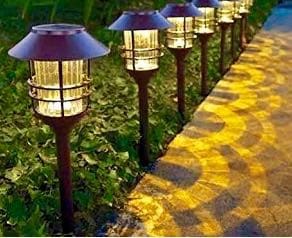 During the fall season the days get shorter, so adding more lighting outside and inside your home is important to emphasize your home's best features and to show off how bright and spacious your property is. Allow more light to enter your home by opening your blinds and curtains during home showings. Add more artificial lighting throughout your home for extra lighting. Fall interior home staging will make your home look charming, cozy, and warm; while highlighting some of its best features. Visual impact is what sells a home because within the first few seconds of walking into a home, homebuyers form an opinion and decide whether they want to buy the home or not. Holiday’s and celebrations such as Thanksgiving and Halloween are during the fall season. Keep holiday décor appropriate, neat, simple, and to a minimum. Too much decorating can distract buyers. Stick with themes that are neutral. Use nature themed décor from the fall season such as pumpkins, hay, or fall flowers instead of displaying ghosts, spiders, monsters, or turkeys. By following these home staging tips you will help make your home more attractive in the fall season and you will sell your home more quickly.